Ugly Duckling Presse (UDP) features authors moving across disciplinary boundaries, crossing performance, sound, image, and text. The work by Ellie Ga, Zahra Patterson, Mike Taylor, and Asiya Wadud combines narrative, essay, and poetry, fusing personal and historical material culminating in an evening of part reading, part performance. 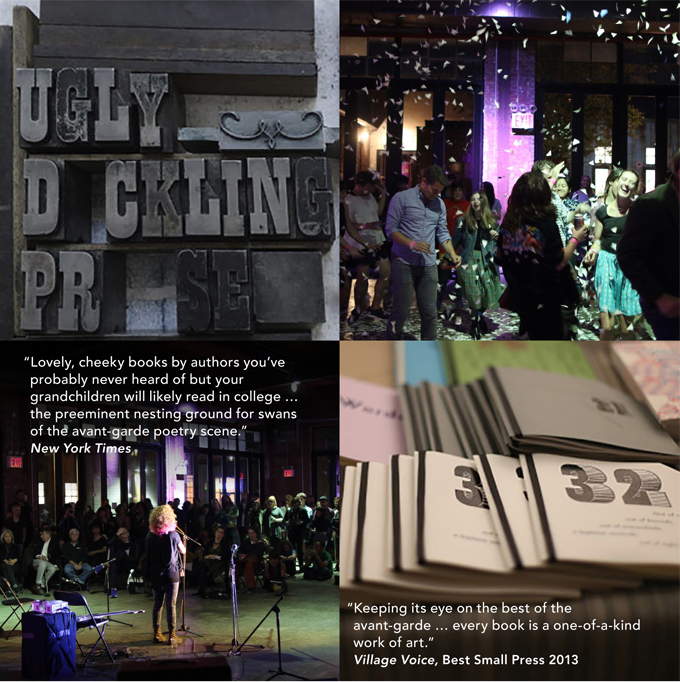 Ugly Duckling Presse, now celebrating its 25th anniversary, is a nonprofit publisher for poetry, translation, experimental nonfiction, performance texts, and books by artists. UDP was transformed from a 1990s zine into a Brooklyn-based small press by a volunteer editorial collective that has published more than 200 titles to date. UDP favors emerging, international, and “forgotten” writers, and its books, chapbooks, artist’s books, broadsides, and periodicals often contain handmade elements, calling attention to the labor and history of bookmaking. In all its activities, UDP endeavors to create an experience of art free of expectation, coercion, and utility. UDP performance photos by Kevin Remy. This performance is supported in part by Poets&Writers.